“Sir” Ernie died peacefully in Hospital with wife Delyse by his side. He’s now at peace in the presence of his Lord and Savior Jesus Christ. He was the 3rd youngest born to Joseph and Mary Schmidt in Saskatoon Saskatchewan. At the age of 17 he joined the Royal Canadian Navy serving in WW2 in theatres of war in N Africa, Italy, Greece &Albania. Specializing in underwater demolition and as Captain of a landing craft, he landed with Canadian troops at Juno Beach in Normandy on D-Day and made many other landings on other beaches with allied troops including the famous “Gurkhas”. His many service metals included a special Greek Liberation medal for his role in evacuating women & children in Greece. In August 2015 he was awarded the rank of Knight of the French National Order of the Legion of Honour for his professional involvement in the liberation of France. He worked for the Haney Correctional Facility and Port Moody as recreational director for many years. Ernie loved to talk to anyone about almost anything, he was like a living encyclopedia in many ways. Magic and being “Santa” were two of his many talents and he was affectionately called “Mr Magic” & Santa. He will always be remembered for bringing laughter and joy to children and adults alike for his many tricks & stories he loved to share. 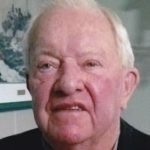 As a boy he spent many hours enjoying hockey on the outdoor rinks in his Saskatoon neighbourhood with his buddies , many of whom became NHL players, including two of his brothers who played for Vancouver Canucks and other American teams. After the war Ernie coached and managed professional and amateur hockey teams in Sask and BC. Swimming being a sport he loved, he coached young disabled youth and managed outdoor and indoor pools in the lower mainland, as well as being a Diving judge in the Olympics. As a proud member of the Royal Canadian Legion he loved to be with other veterans to share wartime experiences. One of the places he loved to spend time was Kailua Kona, Hawaii, friends there have always been considered “extended family”. Ernie and Delyse where married October 26/86 in this beautiful paradise. Before moving to Kamloops in 1991 they lived briefly in Coquitlam and Burnaby. Survived by his loving wife Delyse, son David (Natalie), daughter Lauri (Paul) and their mother Jeanne. Step-sons Brent (Christine), Bryon (Shanna), Robert, Kevin (Kim). Grandchildren Tanya(Mike), Lacy, Trisha (Kyle), Lindsay(Jordyn),Alex, Brian, Jasra, Isobelle, Micky, Jaedyn, Kevin Jr, George, Pippa as well as 9 precious great grandchildren. Brother and sister in-laws – Don & Simone, Gerry & Detty, Michelle, Bryan, Trisha & Carl. Many dearly loved nephew, nieces, cousins and friends. Predeceased by his daughter Linda, parents, 5 brothers, 3 sisters, aunts, uncles and cousins.